Costume Ideas for girls will she be a rock star kitty or a super hero power ranger? We spent two hours making a Perry the Platypus costume, but Mayhem decided to wear her Power Ranger costume from last year. 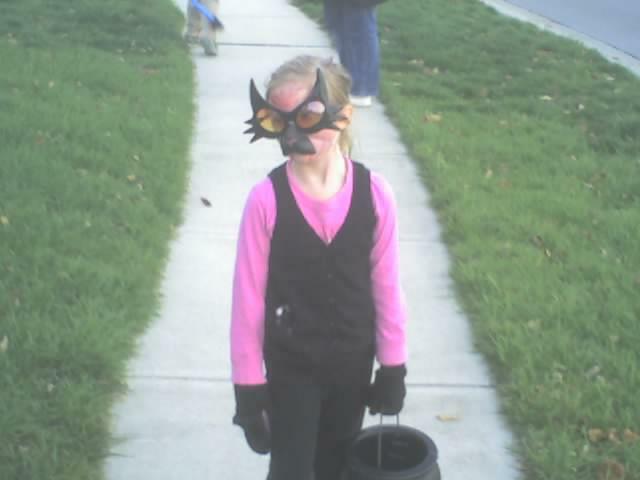 Good thing, because last year we searched high and low for a Green Power Ranger costume, and she decided to go as a Lady Gaga style, black cat. with black snow boots, green gloves, and glow sword. Avatar, Power Ranger, and Headless Scarecrow. so we headed to a safer community event. It was so cold most of the car owners took refuge inside. It's a hearse! It is a car for transporting the dead. A superhero with local heroes. The Trick or Treat event sponsored by firefighters and police. A safe alternative to going door to door.